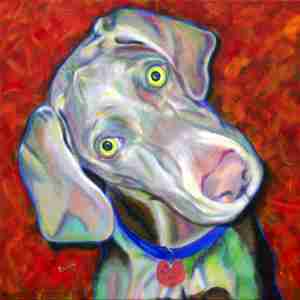 What could be more fun than a hand painted portrait of your pet? A custom acrylic painting of your pet on canvas, in vivid color is a fantastic way to show how much you treasure your "fur-kid", to commemorate one who may have crossed over, or even a Hip way to decorate your space. if you love it, it will make the perfect subject for a smart and precious piece of handpainted art. Even if they are not in the same photo, they can be in the same portrait! PLEASE CLICK HERE TO BROWSE THE GALLERY!